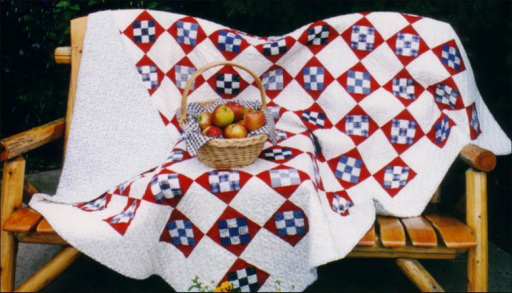 Quilts are a gentle reminder of simpler times and the comforts of home. They are used for so much more than snuggling under on a cool winter evening. Quilts are used for decorating our homes, enhancing the colors of a room or adding a new or unexpected splash of color. There are wall hangings, table runners or a quilt just draped over the back of a sofa. Traditional designs to ultra-modern, the choices are unlimited. My name is Mary Brader and Rocky Mountain High Quilts and Embroidery represents so many of the things I enjoy in life the serenity of the Rocky Mountains, quilting and embroidering. 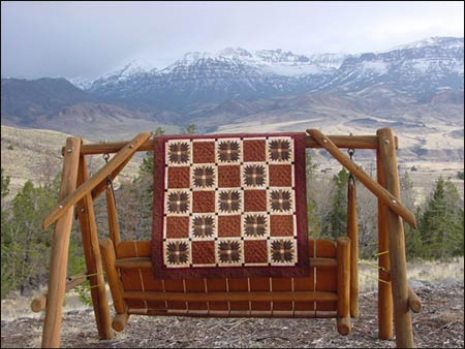 Rocky Mountain High Quilts and Embroidery was named for my love of the Rocky Mountains and my admiration of the late John Denver, who was inspired by the love of their beauty. Quilting has become a passion of mine. I truly enjoy hand quilting but also use machine quilting. I love the rumpled texture quilting gives to fabric. It makes it so three-dimensional. A website is great way to show you some ideas and the quality of my work, however quilts are best experienced in person. Check out samples of my work under GALLERY to give you ideas and see samples of my workmanship. I have always admired quality fabric and beautiful tiny, even stitches in quilts that equates good workmanship. My father always said "Any job worth doing, is worth doing well!" and therefore I expect no less from myself with a lot of attention to detail. Check out items that are currently available under FOR SALE page. I will be adding more items to this section as they are completed, so check back often. If you have an idea or color scheme, we can work on some ideas together to make your project uniquely yours. As you can see we have many dog-related items due to the increasing interest from the students in our dog training school. Looking for that perfect gift? What can compare to a personalized gift? With machine embroidery, a personalized gift can be created for you. As you will see in the GALLERY, we have personalized towel sets, pillows, quilts, bags, Christmas stockings (just to mention a few) with names, animals, fruits, vegetables, baby motifs or many other ideas. A unique gift is something that will always be remembered for your thoughtfulness. © 2007-2013 Rocky Mountain High Quilts. All Rights Reserved.